My area of research is premodern Japanese history (everything up through the mid-nineteenth century). Most of my publications have been on frontiers and boundaries and/or foreign relations. I started out studying the history of northern Kyushu, Japan’s historical “gateway” to the Asian continent. Then I branched out into more general, comparative, frontier history. My current interest, however, is environmental history, that is, the historical relationship between human society and the natural environment. In 2015, Philip C. Brown of The Ohio State University and I published a collection of essays on Japanese environmental history. We are now working, together with Takeshi Nakatsuka of Nagoya University, on an edited volume on climate change in Japanese history and prehistory. It will present the results of a large-scale project, “Societal Adaption to Climate Change: Integrating Palaeoclimatological Data with Historical and Archaeological Evidence,” conducted from 2013 to 2018 at the Research Institute for Humanity and Nature in Kyoto. In 2017, TIME Magazine reporter Olivia B. Waxman quoted me in a fascinating article that appeared in both the online (March 21) and print (April 3) versions of the magazine. The article describes the role of cherry blossoms in Japanese history, paying special attention to what variations in bloom dates seen in the historical record have to tell us about climate change over the centuries. 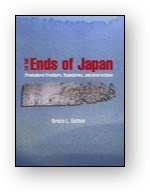 To the Ends of Japan: Premodern Frontiers, Boundaries, and Interactions. Honolulu: University of Hawai‘i Press, 2003. Kokkyo no tanjo: Dazaifu kara mita Nihon no genkei (Birth of the Frontier: Early Japan as Seen from Dazaifu). Tokyo: NHK Books, 2001. Nihon no “kyokai”: Zenkindai no kokka, minzoku, bunka (Japan’s “Boundaries”: State, Ethnicity, and Culture in Premodern Times). Tokyo: Aoki Press, 2000. “Climate and Environment in History.” In The Routledge Handbook of Premodern Japanese History, edited by Karl F. Friday, 23-37. New York: Routledge, 2017. “Hakata and Dazaifu: Crossroads, Boundaries, and Identity Formation in Ancient Kyushu.” In Hakata: The Cultural Worlds of Northern Kyushu, edited by Andrew Cobbing, 13-23. Leiden: Brill, 2013. “Early Japan and the Continent.” In Japan Emerging: Introductory Essays on Premodern Japanese History, edited by Karl F. Friday, 89-97. Boulder, CO: Westview Press, 2012. “An Open and Shut Case? Some Thoughts on Late Heian Foreign Trade.” In Currents in Medieval Japanese History: Essays in Honor of Jeffrey P. Mass, edited by Gordon M. Berger, et al., 303-332. Los Angeles: Figueroa Press, 2009. “Climate Change in Japanese History and Prehistory.” Occasional Papers in Japanese Studies No. 2009-01. Cambridge, Mass. : Edwin O. Reischauer Institute of Japanese Studies, Harvard University, 2009. “Cross-Border Traffic on the Kyushu Coast, 794-1086.” In Heian Japan, Centers and Peripheries, edited by Mikael Adolphson, et al., 357-383. Honolulu: University of Hawai‘i Press, 2007. “Frontiers and Boundaries of Premodern Japan.” Journal of Historical Geography 25, no. 2 (1999): 166-182. “Provincial Administration in Early Japan: From Ritsuryo kokka to Ocho kokka.” Harvard Journal of Asiatic Studies 53, no. 1 (1993): 103-134. “Documentary Evidence for Institutional Change at the Dazaifu, 1000-1185.” Kokusai bunka kenkyu (Obirin University) 11 (1990): 23-60. “Foreign Crisis and Domestic Reform: The Emergence of the Ritsuryo State.” Monumenta Nipponica 41, no. 2 (1986): 199-219.